Michael Schweikardt: What was the impetus of your interest in reimagining big musicals for small spaces? Joe Klug: The impetus was largely practical. When you think of the ways that musicals have traditionally been produced you conjure up images of these large-scale, traditional, “wing and drop” shows. When I was a young designer just starting out, I soon discovered that many of the theaters that were hiring me to work on these musicals were unable to recreate them at that level. They either didn’t have the fly loft or didn’t have the wing space and they seldom had the budget. So naturally, the show had to be reimagined. Not to mention that the wing and drop style had become a relic of an older generation. Michael Schweikardt: Agreed. And as much as I truly adore historic set designs, I don’t think that modern audiences want to be told a story in a style where the storytelling just goes on pause while we change locations. Our audiences crave something more cinematic, right? The gift is that we now get to create ways to continue the storytelling as a part of the scene change; the narrative never stops. Much of the fun for me as a set designer is figuring out how to continue to tell the story in the connective tissue between the scenes. Joe Klug: Yes, figuring out how to connect the scenes cinematically while continuing the storytelling–those are some of the best artistic conversations that I have with a Director. Figuring out how to blend moments together, and what is important to see when leading out of one scene and into the next is so much fun! I truly believe that audiences are craving something new. At the end of the day, everyone has seen the wing and drop version of these shows. They are classics and everyone knows how they function and how they were originally intended to move. It is now up to the next generation of theatre artists to rediscover the stories in these musicals and bring them to life on stage in a new way. Otherwise, they’ll turn into relics, or fossils on display like dinosaur bones in a natural history museum. 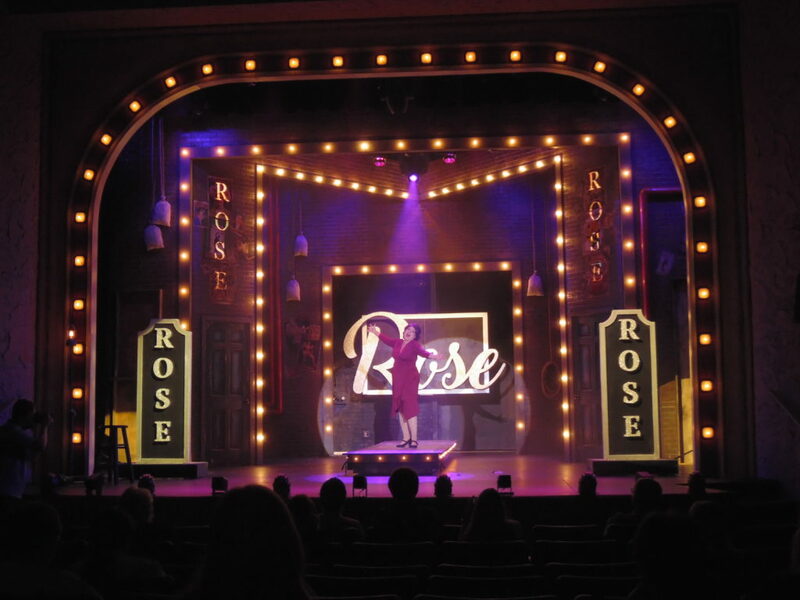 It is our job as scenic designers to help the audience fall in love with these stories all over again. I always take a long, hard look at the story being told. What is their main goal? What are the key elements that are helping to drive the story forward? Once you answer those questions, things start to fall into place. For example, my Gypsy became all about Rose’s relationship to those around her. For me, it was less about various theaters and endless traveling and more about creating an environment where Rose’s larger than life personality would dominate and take over everything around her. Gypsy, Garden Theatre. Directed by Tom Vazzana, Scenic Design by Joe C. Klug, Costume Design by Aj Garcia, Lighting Design by Alyx Jacobs, Sound Design by Jack Audent, Photo by Alesha Hollatz. Michael Schweikardt: Gosh, I love Gypsy. It is quite an intimate show, isn’t it? Most of the scenes and songs consist of only two, three, or four people. With the exception of Louise’s big strip number in the second act, arguably, the Newsboys number is about as big as that show gets. I think it is sort-of misunderstood and mistakenly thought of as a splashy musical. But that is your point, isn’t it? What is the story? What is the story? What is the story? The more I ask this question of musicals, the more I find that even the largest of them has an intimate core. Showboat, considered by most to be an epic, can be reduced down to the story of the love that exists between the members a small, show-business family. If you concentrate on that story, suddenly it doesn’t seem so daunting. Joe Klug: My goal with any musical is to find the intimate core. Strip away all of the added glitz of ‘Broadway’ and you’ll find that any musical can be produced on a small scale. You just need to figure out what makes it tick, what drives the story.